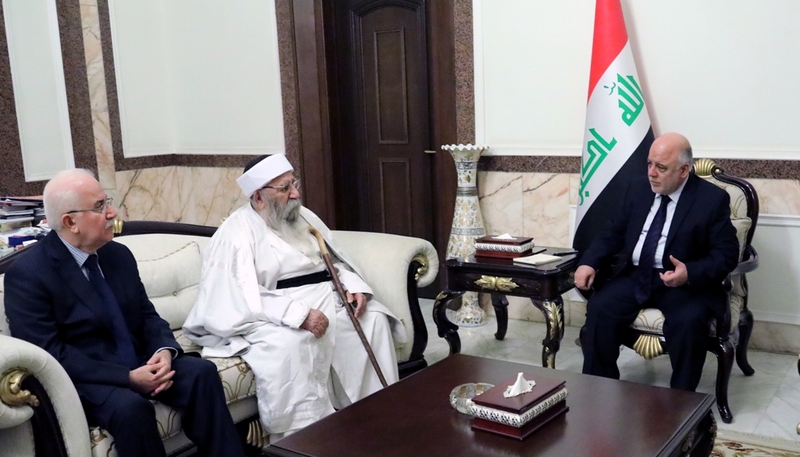 His Excellency Prime Minister Dr.Haider Al-Abadi has received, in his office Today on Sunday, the spiritual father and religious leader of the Yazidi community of Iraq Baba Sheikh Khurto Hajji Ismail and his accompanying delegation. Dr. Haider Al-Abadi has welcomed Baba Sheikh Khurto Hajji Ismail, stressing the keenness of the Iraqi government to take care of all the components of the Iraqi people and its commitment to give it the status it deserves. They are representing a dear part of our Iraqi people. His Excellency pointed to the great victory achieved by our heroic forces in all its forms against Daesh's terrorism, explaining that this enemy in its crimes was brutalized, which no one of our people components could escape from it, including the Yezidi community, His Excellency has added that we are determining to follow up on the displacement and killing that took place and that the government will work to bring the Yazidis back to their areas as soon as possible after ensuring that they are free from mines and explosives and implementing the Stability Support Plan in cooperation with the international community, as well as the ongoing search for victims of terrorism. For his part, the spiritual leader of the Yezidi community has praised the victory achieved by his Excellency Prime Minister that gave the Yazidis hope to return to their areas, after the killing and destruction was caused by Daesh, Stressing that the Yezidis proud in belonging to their country Iraq. Dr. Haider Al-Abadi has listened to the observations presented by the delegation and directed to follow up and resolve it.